Admiration to companies that listen to their customers/users and make the experience (web site, service, product) better based on this. It takes a smart and humble company… but all should. It is only logical, right? This is what the evolution of the web is… communication both ways. And then reaction to make the experience/service/product better. Found two cases – two completely different markets and purposes and methods – on the use of such tactics – form Get Elastic and Creuna (sorry this one is only in Swedish for now). 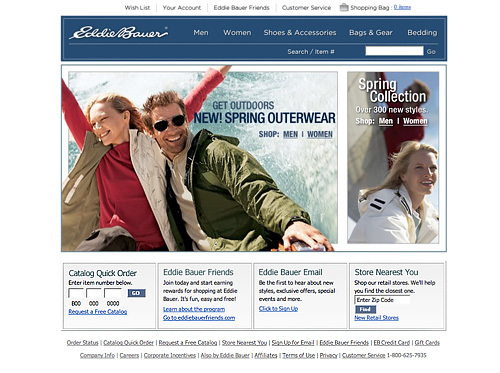 Eddie Bauer recently revamped its online store design using customer feedback. At first glance, it’s hard to see much difference other than the doesn’t look like much has really changed. 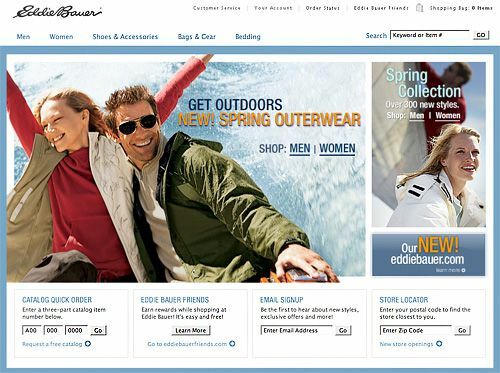 But when you look under the hood, you find Eddie Bauer’s packed its new site with plenty of Web 2.0 to improve usability and customer satisfaction. 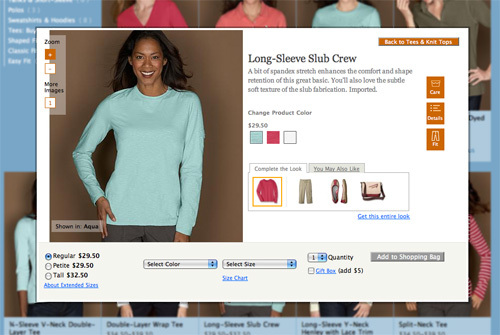 Eddie Bauer calls this “virtually picking up” an item, and “putting it down” to continue browsing that category. 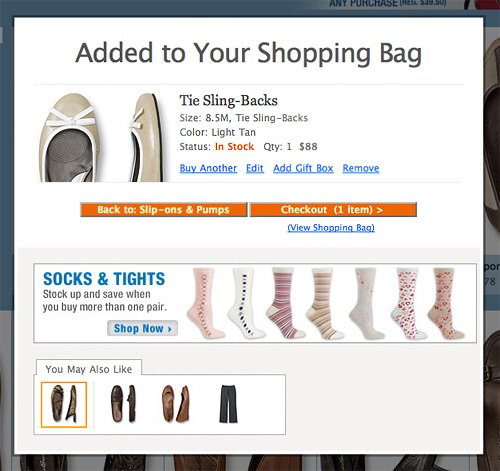 The favorite – a consumer friendly shopping bag with great options and cross-selling. 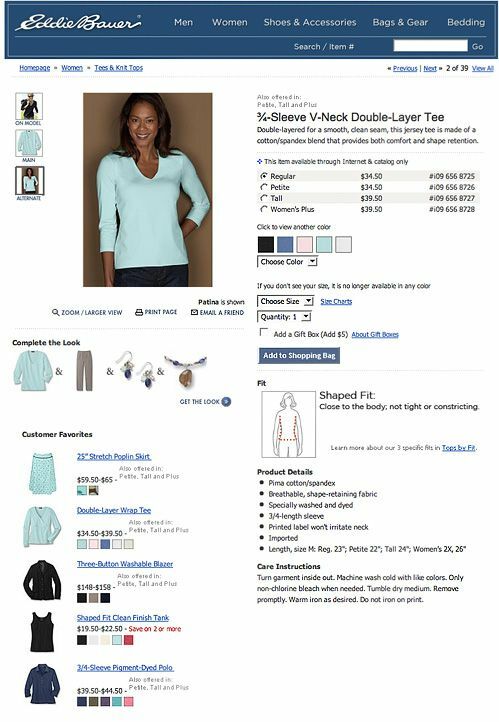 Eddie Bauer’s “Add to Shopping Bag” confirmation gives full details of which item, size and color was added, the price, availability (in stock), cross-sells and links to check out, “>continue shopping or add a gift box. 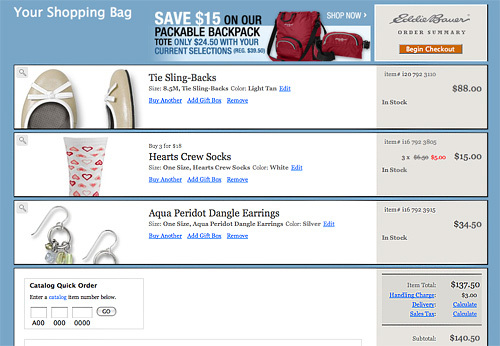 Trust me, I’ve looked at hundreds of “add to cart” confirmation methods, and I really dig this one. Creuna och Stockholms stad har ett strategiskt partnerskap kring Stockholm Webb, som innefattar den stadsgemensamma intranätslösningen och www.stockholm.se. Creuna har arbetat med Stockholms stad sedan 2005 med koncept och interaktionsdesign för båda webbplatserna, användarstudier, fokusgrupper, webbutveckling, integration, redaktörsutbildningar, funktionell och teknisk förvaltning samt tekniska förstudier inför satsningen på e-tjänster för medborgarna. Beta-version av nya stockholm.se växer fram successivt under våren. Under tiden den nya sajten tar sin fulla skepnad finns gamla stockholm.se kvar. Med den öppna utvecklingsprocessen ges chansen att involvera stockholmarna i slutresultatet. Creuna har arbetat fram koncept, interaktionsdesign och form och gör även utvecklingen. För att skapa förutsättningar för kommande e-tjänster till medborgarna används den senaste tekniken och funktionaliteten inom området. Nya stockholm.se följer WAI och Vervas riktlinjer för tillgänglighet. Utvecklingen av nya stockholm.se sker med starkt fokus på medborgarna. Fokusgrupper har genomförts på ett tidigt stadium för att utforma interaktionsdesign och struktur. Webbplatsen utvecklas i en öppen utvecklingsmiljö med en beta-version där medborgarna ges möjlighet att spela en viktig roll i utformningen. Kommunikationen sker via utvecklingsbloggen för Stockholm.se. Here we have a very interesting way of developing a new site with the help of the users/citizence. For a public service site such for Stockholm city this is defiantly the way to go – get the users/citiceze involved in the process and make them feel as a contributing part of the project. Benificial for both parties and seriously good for the bottom line. If managed right you will end up with a great site. While the new site is under construction the old one lives but with clear CTA to take part int the development of the new. The main page of the developing site. Here you get info on what this all is about with some nice animation. Your are encouraged to click around (the site in development) and enticed to take part in the development thought the blog. It also shows in percentage how far the project is as well which is a nice feature. And the blog page or conversation page as they call this. Here one can follow the story, get more info, vote and take part. The posts generally asks the user to comment and give feedback.